I'm an automotive enthusiast and I want to build some gauges by myself using Arduino. I was taking a look at this pressure transducer or sender, 100 psi, stainless steel, for oil, fuel, air, water and I was thinking if I can use this sensor to do all of the these tasks: Water, Boost and Oil Pressure. Am I correct? Can I use this sensor? You math checks you to me. When you code it, You will probably read a voltage using an analog pin (or external ADC) that will return an integer between 0 being 0 volts, and 1024 = vin volts. vin will be 5 if you don't wire up the vin pin, and 1024 could be different if you use an external ADC. notice that the datatype float is used (enables decimal points) and that the constant being divided by is also a float so that the calculations will definitly happen between floating point numbers. I'd add code to test for voltage between 0.0 to less than or near 0.5 volts. 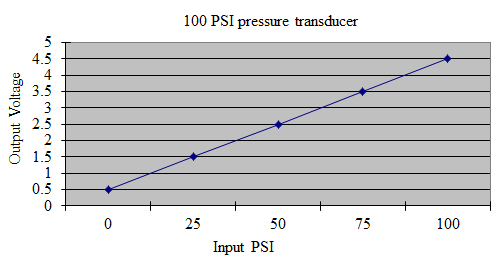 Disconnected pressure transducer won't present 0.5v, 0 PSI transducer voltage; not output 0.5 v @0 PSI shows a lower voltage indicated a fault or open circuit in transducer wiring. My experiences, too many times other engineers "borrowed" hardware and I wound up troubleshooting a non-fault but theft ;} Only a few lines of code to ensure connections are correct. The floating point vs integer arithmetic compute time is outweighed by settling time of A/D converter and transducer. The auto part was my solution to show HOA board stats for my wildly varying water pressure at Condo Assn, very cost effective too.